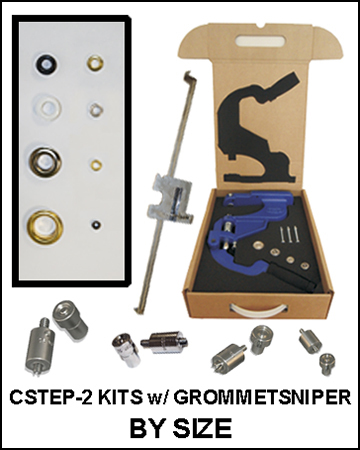 Buy a ClipsShop CSTEP-2 grommet bench press metal grommet attaching kit with GrommetSniper to set grommets professionally and accurately with repeatable spacing. Choose your size category below to view all colors for that size. Select a category below to buy a CSTEP-2 grommet hand press kit including popular sizes of solid brass self-piercing metal grommets in your choice of 5 grommet hole sizes and 5 metal finishes complete with a set of self-piercing stainless steel setting dies, a grommet attacher tabletop hand press, and the ClipsShop GrommetSniper as part of a package deal. 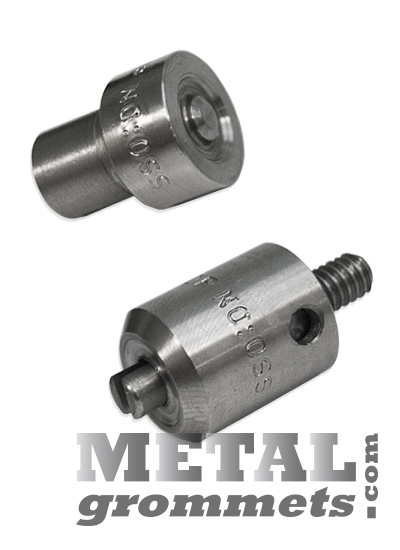 This professional-grade grommet setting package comes complete with everything you need to apply ClipsShop self-piercing metal grommets in many popular grommet hole sizes and your choice of five finishes.